Yes that is not a natural. It is a home made one. Here one Dyckia marnier ( One of the several kinds) and a Dyckia brevifolia Izabel got together. Here just one year and a half ago they had fallen in love! The Izabel form of D. brevifolia has broader wider leaves and comes from the Ibirama region on the High Itajaí river Valley in Santa Catarina. Have u seen this plant yet? It is not on the top of that unreachable mountain nor on that vertical stony wall nor down that torrid valley, no, it is not anywhere in nature, no wilderness guards that beauty of all beauties. It may be right inside that plastic box on your windowsil. Yes, it may be on your heater near to one window looking the lazy falling snow or it maybe sweating all over under some tropical sun. Dyckias accept your touch, your creation, your idea of beautiness... yes it is still to be made.....träume! There is no use to live without dreams. All I wish you is TRÄUME! Look, the silver ones are smaller ´cause they take longer to grow. Brothers from the same bunch of seeds. Down under you see one Dyckia brevifolia Izabel. Have you seen a broader or wider leaved Dyckia? 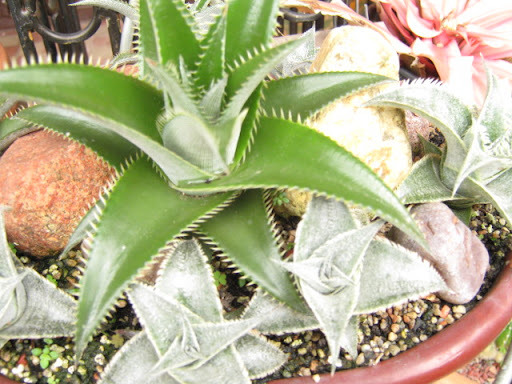 It comes from the Ibirama region and is one of the two envolved in the criation of Dyckia Mundo. The coin is a one cent Euro coin.